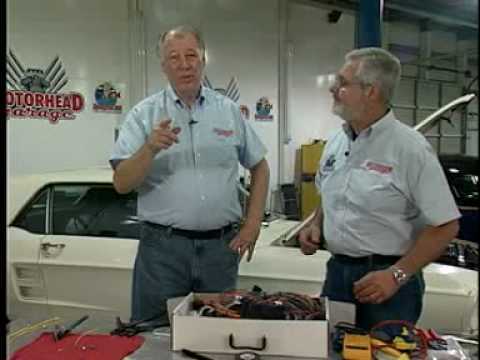 Follow our R&D specialist, Don Bock, in our new 7-part video series as he researches, installs, and tests the new 1962-67 Nova kit in a 1967 Nova project vehicle. Tune in! New headlight switch with internal 30amp circuit breaker, retention collar nut, adjustable length shaft, and custom knob. Standard turn signal flasher, hazard flasher and horn relay mounted on harness. NEW compact ATO-Style fuse panel that is fully encased in a closed box assembly with two mounting pads. The fuse coverlid is labeled on the inside identifying all circuits by description and their respective fuse ratings. All high amperage output circuits incorporate the same superior spring steel reinforced terminals that are used in our “Highway Series” kits. This kit also utilizes a remote bulkhead assembly that mounts in the stock location. All required hardware supplied. Harness is laid out and formed to allow for nearly all after market accessories such as; gauge packages, wiper systems, heat and air conditioning systems, etc. Original switch connector bodies – an American Autowire exclusive feature. Steering column connectors can plug directly into most aftermarket steering columns or stock 1962-67 GM columns that use stock GM turn signal switches. Rear body harness assembly plugs into the main harness in the stock location and our longer leads allow for stock or custom routing the wires. Rear body wiring includes backup lamp, stop, turn and tail lamp lead wires along with their correct light sockets, license plate lamp connection wire, and fuel tank sender wire and connection along with the proper trunk floor grommet. New ignition switch, tumbler and key are provided. Front lighting includes extra long leads that can be routed for stock or optional appearances. All headlight, park light and directional light connectors and terminals are provided along with a switched trigger wire for an electric fan relay (usually recommended with AC).